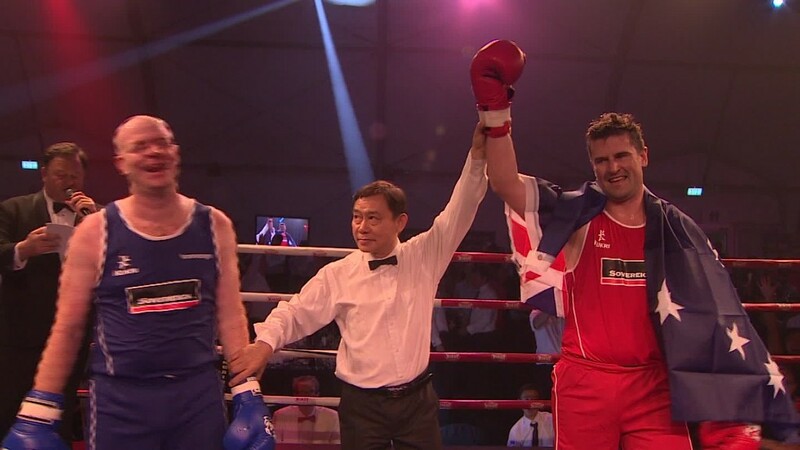 Why are bankers stepping into the boxing ring? "Jab left is 1, punch right is 2. We're gonna do 1-1, 1-2, 1-1-2, 1-2-1, got it?" the boxing trainer barked. "Go!" I -- like everybody else around me -- was a bit confused, but we all started drilling punches into the air, trying to keep pace with the flurry of instructions. "Harder! Stay light on your feet! Faster!" Welcome to the last few months of my life. I've been training alongside dozens of boxers gunning for a coveted spot in Hong Kong's annual "Hedge Fund Fight Nite." It's exactly what it sounds like: A white-collar boxing competition that raises funds for charity by getting the city's bankers to shell out money to watch their buddies beat each other up. White-collar boxing has ballooned in popularity in global financial centers like London and Singapore since getting its start in the late 1980s at Gleason's Gym in Brooklyn, where prizefighters like Mike Tyson and Muhammad Ali once trained. When Wall Street types started gathering at Gleason's to blow off steam, "I figured I had to do something to keep their interest," said owner Bruce Silverglade. "So I decided to organize a competition for them." The first match pitted a multi-millionaire businessman with a Ph.D in English literature against a dual-career lawyer and veterinarian. "It went viral from there," Silverglade said. 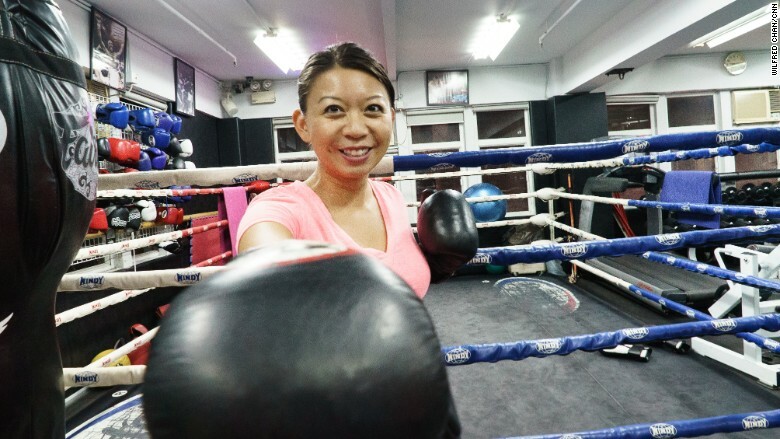 The event in Hong Kong, organized by Ironmonger Events, gives anyone working in finance without boxing experience a chance to get into fighting shape -- and a shot at glory in the ring. (All I wanted was to chase a fun story). We started in May, first with rigorous circuit training: 20 jumping jacks, 20 squats, 20 lunges, 20 split jumps, 40 mountain climbers, 10 pushups with plank crunches, 10 frog jumps, 10 burpees ... and more -- as fast as you can, times five. I'm pretty active -- my regular mix includes hiking, running, open-ocean paddling and yoga. Still my training partners and I would be winded within minutes, and ready to collapse after an hour. The initial group quickly halved as exhausted hopefuls dropped out. At first, I thought I'd never get used to someone throwing a punch at my head, nor could I keep my eyes open when blocking the blow. Watching your opponent is crucial, though it takes immense focus -- far more than I expected, and that's coming from a journalist who is always on deadline. But it had to happen sometime. In late June, I finally got hit squarely in the face by Gabby Kitney, who works at Communique, a corporate public relations firm. I spun backwards in shock and my nose went numb. Actually getting punched killed my fear -- once it happened, it felt like I'd been there, done that. It pushed me to counter even harder, and was a great reminder to keep my hands up and be ready for anything. After all, as the trainers said: "There's only one rule in boxing: You hit, and you try not to get hit." At one point, I balked when I was paired up with Chris Lambe, one of the group's toughest and most agile boxers, who at six feet towered over my five foot, two inch frame. I couldn't stop picturing myself as a puddle on the floor. But Lambe, a vice president at insurance firm Marsh, turned out to be an excellent partner, coaching me to block blows to my torso and strengthen my left hook. "Keep your elbows close to your body," he kept reminding me. "And look at me when you duck -- don't look down." I was surprised to discover how technical boxing can be -- it's not about throwing random punches, but a calculated sequence of observing, attacking and defending. I was always glad to hear the sound of peeling Velcro pierce the air as everyone tore off their boxing gloves -- that meant training was over. The layer of sweat that had dripped onto the mats would get mopped up, and the svelte professionals that filed in an hour ago in designer togs would stumble out looking like a pack of wet dogs. It was an interesting experience -- exhilarating to punch something at the end of a long day, and fun to try something new. Despite all the violence, I even made a couple friends.